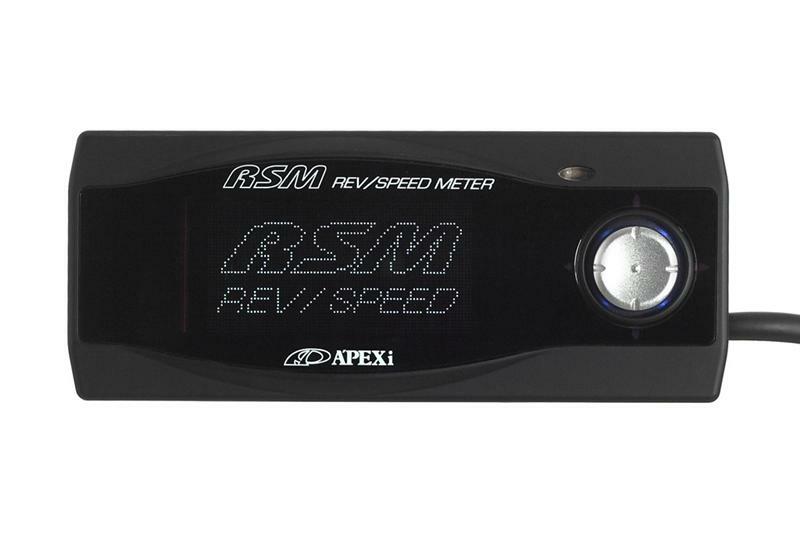 The new Rev/Speed Meter GP is a complete multi function measuring device designed to measure and monitor data such as vehicle speed, engine RPM, and elapsed times. However, the strength of the new unit lies in its differences. Probably the most obvious being its completely redesigned look. This new aesthetically pleasing model was crafted to match the likes of other highly popular A’PEX electronics such as the VAFC (VTEC Controller) and the AVCR (Boost Controller). The new screen utilizes the easy to read VFD (Vacuum Fluorescent Display) with built in light sensor used in many of A’PEX’s line up. The new unit also delivers a host of new functions. Standard features include: Engine RPM, Vehicle Speed, Travel Distance, and Battery Voltage (All which can be displayed in real time graph mode, numerical mode, or analogue mode; 1-4 channels at a time. ), Peak Hold, Replay (With 60 second playback. ), Speed Limiter Cut, 0-100m, 200m, 400m times with trap speed, 0-100km/h, 200km/h, 300km/h times, 100km/h, 200km/h, 300km/h E0 times, user defined Mid Range Acceleration, Stop Watch functions, Best Time Memory, RPM Warning, Speed Warning, RPM and Speed Outputs (For external devices requiring an RPM or speed signal. ), Tire Size Correction (For acceleration and timing accuracy. ), and Vehicle weight input. One of the most exiting of the new features is the option to utilize the revolutionary A’PEX G-Sensor (Sold separately). The G Sensor allows the unit to measure G forces in 4-way front/rear/left/right directions. This data can be plotted in a graph display to map acceleration characteristics and lateral G’s on the race track, or used in an array of new features including: Highly accurate 100m/200m/400m times with trap speed and wheel-spin correction, Horsepower Calculation, and Loss Power Calculation. By taking advantage of the optional G Sensor, the user can produce extremely accurate acceleration measurements. Usually, when measuring acceleration times using the speed sensor signal alone, the meter will end measurement too early (shorter distance) due to wheel-spin. Using the G Sensor modifies the speed sensor signal, compensating for wheel-spin and producing impeccably accurate acceleration times.